Synthetic & Bio-based Aniline Market was estimated over USD 11.5 billion in 2016 and the industry will likely grow by a CAGR of about 6.5% up to 2024. Aniline is primarily used for methylene diphenyl diisocyanate (MDI) production which finds extensive application in construction, appliances, transportation, and furniture industries. High demand for MDI applications in these end-user industries will drive the global synthetic & bio-based aniline market in the forecast timeframe. MDI is used to synthesize both rigid and flexible polyurethane foams which are extensively used as insulation materials. High growth in the Asia Pacific construction and automobile industries will augment the global synthetic & bio-based aniline market growth in coming years. Asia Pacific has the highest construction spending in the world accounting for almost 50% of total spending in 2015 with China, Japan and India leading the way. Chinese construction spending was around USD 1.8 trillion in 2015 with an estimated growth rate of about 7% in coming years. Heavy government as well as private construction spending will boost residential, industrial and infrastructural development activities during the forecast period contributing to the global synthetic & bio-based aniline market growth. Rigid polyurethane foams are extensively used in building construction for insulation and roofing purposes. They help in reducing air leakage, improves indoor air quality, and decreases energy consumption for heating & cooling leading to reduced greenhouse gas emissions. Polyurethane spray foam is also used to strengthen buildings by resisting wind uplift and protecting against severe weather conditions. The rapid construction industry growth will increase polyurethane foam demand in coming years which will in turn drive the synthetic & bio-based aniline market till 2024. Rising automotive production in North America and Asia Pacific will positively influence the synthetic & bio-based aniline market growth in the forecast period owing to wide polyurethane usage in automobile manufacturing. U.S. motor vehicle production rose from 11.6 million in 2014 to 12.1 million in 2015, increasing by around 3.8%. China motor vehicle production also increased by around 3.3% during the same period from 23.7 million to 24.5 million. India witnessed the highest motor vehicle production growth rate of 7.3% from 2014 to 2015. The increasing automotive production in these countries will augment the global synthetic & bio-based aniline market growth as polyurethane foams are widely used for their cushioning properties in car seats, headrests and armrests to reduce fatigue during driving. They are also used in car bodies as insulation to provide protection against noise and heat of the engines. Polyurethane foams help reduce the weight of cars resulting in lower fuel consumption and better environmental performance. By process, the global synthetic & bio-based aniline market is segmented into two categories including reduction of nitrobenzene and substitution of chlorobenzene. Reduction of nitrobenzene is the most commonly used manufacturing process owing to better yield, faster reaction rate and higher product recovery. In 2016, reduction of nitrobenzene process accounted for more than 90% of the total aniline produced globally. This process segment is likely to gain by a CAGR of about 6.5% during the forecast timeframe. Substitution of chlorobenzene process segment is likely to grow with a CAGR of 5% till 2024. Copper-exchanged catalysts at vapor-phase or copper-impregnated zeolites are the ideal catalysts for this process. The process has an aniline selectivity of 90 - 94% and produces benzene and diphenylamine as by-products. The global synthetic & bio-based aniline market is segmented into synthetic and bio-based categories. Synthetic aniline segment market size was registered at around USD 11.5 billion in 2016. Almost all aniline manufactured around the globe is synthetically produced and its demand it likely to rise by a CAGR of about 7%. It may lose its share to the newly developed bio-based aniline owing to the latter’s eco-friendly nature. Covestro is the only company which has invented a process to manufacture bio-based aniline by combining sugar and ammonia using a micro-organism. Its production is likely to start from the 2017. With increasing demand for eco-friendly products, bio-based aniline product segment will have tremendous growth opportunity and its market is likely to expand by a CAGR of more than 18% in the forecast period. 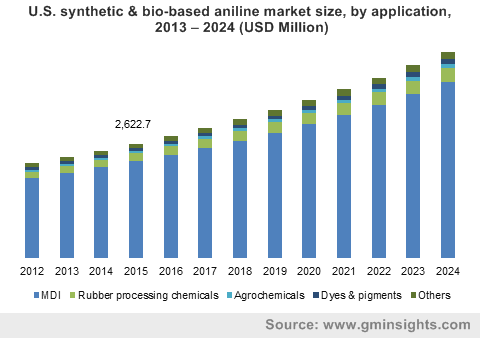 The global synthetic & bio-based aniline market is categorized into five application segments including MDI, rubber processing chemicals, agrochemicals, dyes & pigments, and other applications such as specialty fibers, production of diphenylamine, etc. MDI is the major application segment accounting for more than 80% of the global market in 2016. This segment is likely to grow by around 6.5% during the forecast timeframe. Increasing MDI demand for polyurethane production will augment the MDI application segment’s growth. Dyes & pigments application segment registered a revenue of more than USD 950 million in 2016 and is likely to gain by more than 5.5% CAGR during the forecast timeframe. This segment’s growth will be propelled by rising demand for dyes & pigments in textiles, plastics and leather industries. High growth in the apparel and plastic industries in the developing economies of Asia Pacific will contribute to the segment’s development in the future. Based on end-user, global synthetic & bio-based aniline market is segmented into construction, rubber products, transportation, consumer goods, adhesives & sealants, packaging industry, textiles, agriculture, and other end-users such as pharmaceuticals, pulp & paper, photography, electronics, etc. Construction is the largest end-user segment in the synthetic & bio-based aniline market accounting for more than 30% of the overall industry size in 2016. The segment is likely to grow by a CAGR of about 7% in the forecast period. Its growth will be augmented by rising construction activities in the Asia pacific region. Increasing demand for green buildings which has reduced energy requirements for heating and cooling will also fuel the demand for synthetic & bio-based aniline in the construction industry. 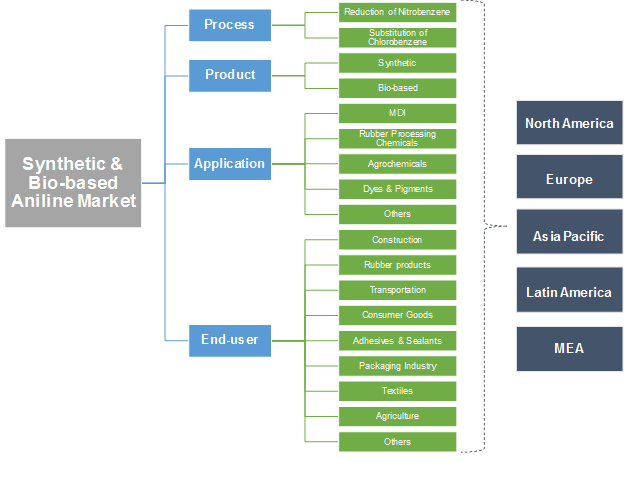 Packaging industry is also a key end-user segment in the synthetic & bio-based aniline market which is likely to witness high growth of over 7% CAGR till 2024. The segment generated more than USD 850 million in 2016 and its growth will be chiefly fueled by rising demand for plastic packaging in various industries. Favorable growth in the medical and fast-moving consumer goods sector in North America and Asia Pacific will contribute to the packaging end-user segment’s development during the forecast timeframe as plastic packaging is extensively used in these industries. North America is a major synthetic & bio-based aniline market which registered revenues amounting more than USD 2.5 billion in 2016. The regional industry is likely to grow by about 6% CAGR till 2024 owing to increasing construction activity following the recovery from the financial crisis of the past decade. Robust growth in the automotive sector in North America will further augment the synthetic & bio-based aniline market growth. High nitrobenzene production in the U.S. will also positively influence the industry growth in North America as it is the primary raw material for aniline production. Europe is also a significant synthetic & bio-based aniline market accounting for about 30% of the overall industry size in 2016. The European market will witness gains of about 6.5% CAGR owing to rising automotive production in countries such as Germany, France, UK, and Spain. The European market will also be influenced by rising construction activity in the developing countries of Central and Eastern Europe. The global synthetic & bio-based aniline market has many large and small companies involved in the manufacturing and distribution of the product. Some of the key players in the market include BASF SE, The Chemours Company, Huntsman, Dow Chemicals, Sumitomo Chemical Co Ltd, Sinopec, Covestro, Tosoh Corporation, Yantai Wanhua Polyurethane Co Ltd, Hindustan Organic Chemicals Limited, BorsodChem MCHZ, Jilin Connell Chemical Industry Co., Ltd., Shandong Jinling Group Co., Volzhsky Orgsintez JSC, SP Chemicals Holdings, Ltd, etc. Market participants in the synthetic & bio-based aniline market are using strategies such as capacity expansions and mergers & acquisitions to increase their industry share and competitiveness. They are also entering into long-term supply agreements with raw material suppliers to ensure a steady flow of input materials for their production needs at cost competitive prices. Aniline, aminobenzene or phenylamine is an aromatic amine used as a precursor to complex chemicals. Its major application is in the manufacture of MDI which in turn is used to produce polyurethane foams. Aniline is usually manufactured by nitration of benzene into nitrobenzene and hydrogenating it in the presence of catalysts. Although aniline can also be manufactured from ammonia and phenol, the rising prices of phenol has forced manufacturers to switch to the hydrogenation process. The increasing usage of polyurethane foams in various applications is driving the synthetic & bio-based aniline market growth.